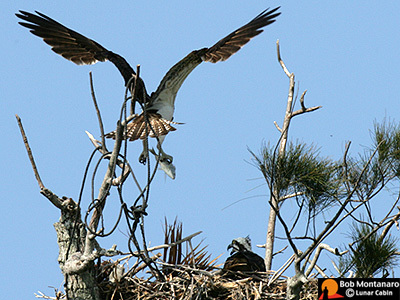 The nest provides a grandstand view of a rocket launch from Cape Canaveral for the female Osprey and the hatchlings. View a larger image and more information about the launch. 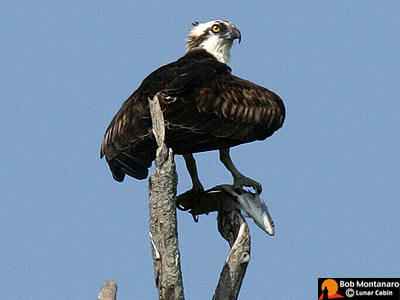 The female Osprey quietly waits for the male's return. 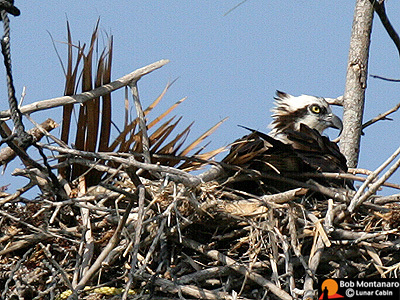 A new addition to the nest is the palm frond which both Ospreys were tripping over as they walked around the nest. 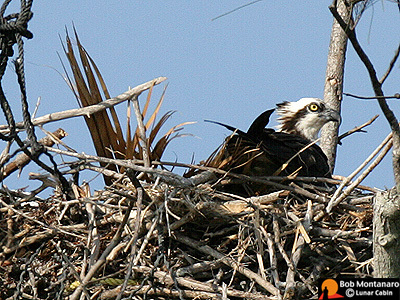 It probably does serve to shade the interior of the nest, though, providing some relief from the Sun for the hatchlings. 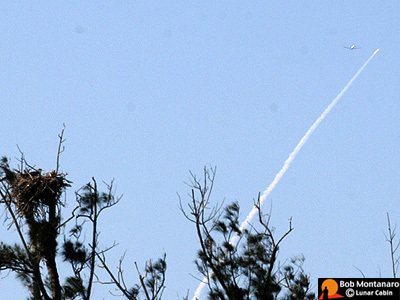 The male Osprey comes flapping his way back from over the Indian River Lagoon. 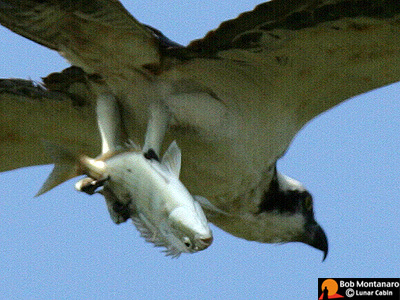 The live fish he carried had a look of upside down woe appropriate to its new position. 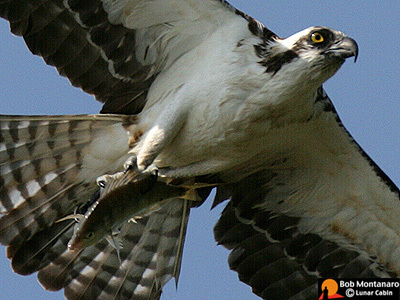 All the live fish the male Osprey carries back gamely struggle in his talons but it is always a losing battle. Besides, even if they could get free it is then a long drop to the ground and the end is the same. The male made only a brief stop on the lookout perch to dry his wings. He flew to the nest with a look of confident determination. The fish did not look so sure. The fish was still alive but on its last legs as the male made his landing. The female, at right, is happy to see what her mate has brought. 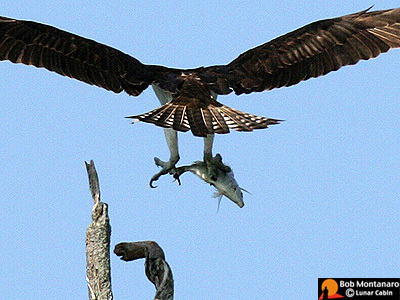 The female immediately began to tear into the fish. She fed herself and the hatchlings. 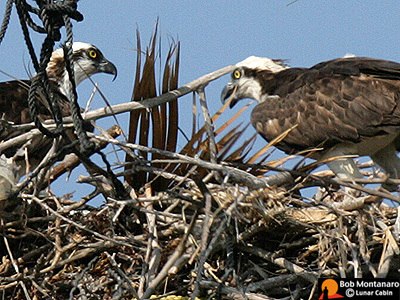 Though the camera was not able to capture them, glimpses of two hatchlings were made out. 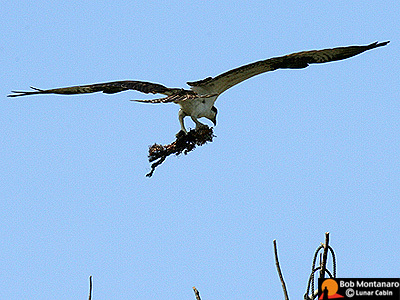 The male left after dropping off the fish to return with more material for the nest. 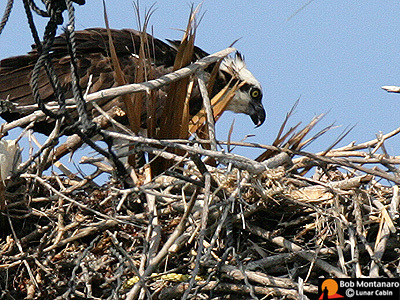 The female and the hatchlings ate the entire fish. The female was observed eating the tail fin. 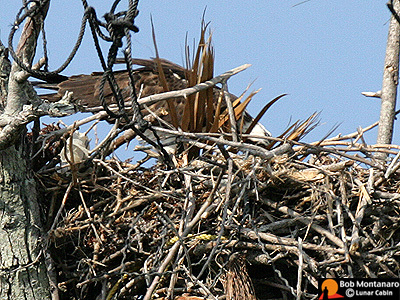 After eating she moved some branches around then settled back down in the nest just like she was at the beginning.